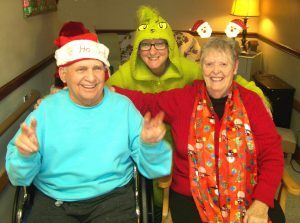 OSWEGO, NY – Even a visit by The Grinch couldn’t spoil the fun for the residents during Morningstar Residential Care Center’s Christmas open house. From left are Howard Anthony, Activities Aide Doreen Shortt, and Claire Anthony. Residents and their families enjoyed hors d’oeuvres and Christmas goodies and they gathered together for Christmas cheer and to take part in a number of Christmas themed activities. Located at 17 Sunrise Drive, Morningstar is a family-owned and operated, 120-bed long-term and sub-acute skilled nursing facility with full rehabilitation services including: physical, occupational and speech therapy; post-surgical orthopedic care; respiratory care; and additional sub acute care services.